Shaft: Callaway Project X Velocity Graphite. Make: Callaway. Model: X Hot 15 3 Wood. Flex: Regular. Condition: 8/10 Very Good ( There is a little light scratching/scuffing on the crown. Length: Standard. ). The club has a factory Project X Stiff flex graphite shaft and has a Callaway grip. (drivers, fairway woods, hybrids, single irons, wedges, putters. ). Dexterity - Left Handed. Loft - 15 . We will not do it. Rest assured! 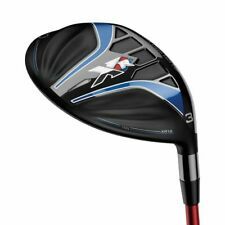 Callaway XR 3-Wood is new. It features a Grafalloy ProLaunch Blue 65 gram shaft with a Velvet Style grip. Manufacturer: Callaway. Shaft Material: Graphite. We will be happy to assist you! Shaft Flex: Regular. MODEL: DIABLO OCTANE. SHAFT: FACTORY INSTALLED CALLAWAY 60 GRAMSHAFT. FLEX: REGULAR. Shaft - Synergy 60. Flex - Regular Flex. Grip - Golf Pride Tour Wrap Midsize. Dexterity - Right Hand. Graphite Shaft - Project X HZRDUS 65g Regular R Flex. Callaway Great Big Bertha Epic 15° 3 Fairway Wood. All single pieces (drivers, fairway woods, hybrids, single irons, wedges, putters. ). Standard length. Fujikura Pro Green 72 regular flex shaft. Very good condition - lots of pics.see for yourself. Graphite shaft - Project X HZRDUS 6.0 Stifff lex. Callaway Rogue Sub-Zero 15° 3 Fairway Wood. All single pieces (drivers, fairway woods, hybrids, single irons, wedges, putters. Right Handed. ). SHAFT - MIYAZAKI TOUR ISSUE 59 R GRAPHITE. FLEX - REGULAR. THIS FAIRWAY WOOD IS IN GOOD SHAPE WITH NORMAL WEAR TO THE FACE AND SOLE. THERE ARE A COUPLE OF PAINT BLEMISHES ON THE CROWN DUE TO NORMAL COURSE OF PLAY. Used RH Callaway Great Big Bertha 15° 3 Wood Mitsubishi Rayon KuroKage Black TiNi mid kick mid torque R Flex 50 gram shaft. Golf Pride New Decade midsized grip new last summer. See photos for condition hardcover included Shipped with USPS Priority Mail. 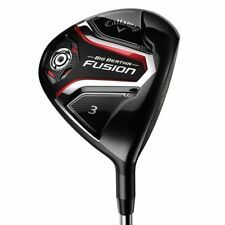 Callaway 2019 Epic Flash Sub Zero Fairway 15* 3 Wood -HEAD ONLY. Condition is Used. Only used 3 rounds. In excellent condition. No sky marks or any major dings or scratches. Headcover included. Shipping is $15 and to conus only. I accept paypal only. Bid with confidence! Callaway Rogue Right Handed 3-Wood 15° Synergy 60 Regular Flex Graphite Shaft. FOR SALE: Callaway Rogue Right Handed 3-Wood 15° Aldila Synergy 60 Regular Flex Graphite Shaft. Shaft: Aldila Synergy 60 Regular Flex Graphite Shaft. Head Cover is included! This club has markings on the face and scratching on the sole of the club from normal use. Callaway GBB Epic 15° 3 Fwy Wood - Project X HZRDUS 65g Shaft Regular R Flex. and comes with Green and Orange pompom head cover, and callaway wrench tool. ( see photos for club and Pompom head cover. Shipped with USPS Priority Mail. I do not ship internationally within 48 States USA only. Shaft: Project X Lz 5.5. Loft: 15 Degrees. frequent play and may have natural scratches, pop up marks and/or bag wear on. Shaft Flex: Regular. The clubs are nearly impossible to differentiate from new. Epic Flash. Standard Lie. Shorter, lighter hosel system repositions the CG for easy launch and high, long-carrying flight. New Flash Face Technology for unprecedented ball speed. Project X Even Flow Green 65 Graphite. Shaft: Fujikura Speeder 565. Shaft Flex: Senior (A-Flex). Shaft Material: Graphite. frequent play and may have natural scratches, pop up marks and/or bag wear on. Loft: 15 Degrees. imperfections but will look better than the average club in most players’ bags. Condition - Used Dexterity - RH Brand - Callaway Model - Rogue Type - Fairway Wood - 3 Wood Loft - 15* Lie Angle - STD Shaft Model - Aldila Synergy 60 Shaft Flex - Stiff Shaft Type - Graphite Shaft Length - STD Grip - Golf Pride Tour Wrap - Blue Headcover - No Headcover Additional Comment - Golf Club has a couple of ball marks on topline. Project X HZRDUS 6.5. ROGUE SUB ZERO. Otherwise Super Clean.. FACE :-few soft scratches to the face. Right Handed. Shaft Make Shaft Length Shaft Material. NEW CALLAWAY EPIC FLASH 3 WOOD 15* PROJECT X EVEN FLOW 5.5 REGULAR & COVER 2019. Condition is New. RH Callaway Golf Great Big Bertha Epic 15 Fairway #3 Wood, Diamana Green M 50 Regular Flex. Flex - Regular Flex. Grip - Golf Pride Tour Wrap Midsize. Shaft - Diamana M 50 Green. Dexterity - Right Hand. 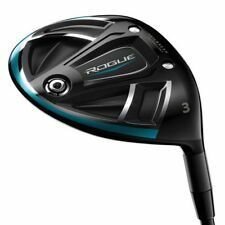 Callaway Rogue Sub-Zero 15° 3 Fairway Wood. All single pieces (drivers, fairway woods, hybrids, single irons, wedges, putters. Graphite shaft - Project X Even Flow 75g 6.5 Extra Stifff lex. Right Handed. ). Callaway 2014 Big Bertha Fairway 3 Wood 15* with custom UST Axivcore Black 69 Stiff Shaft . Club Plays 43" long. Custom Iomic grip and headcover included. Condition is Used. Shipped with USPS Priority Mail. Please see all photos and ask any questions before bidding. Chat with me on Golfwrx anytime. Callaway Great Big Bertha Epic 15 Degree 3 Wood HEAD ONLY. Missing the screw for the adapter. I am not in this to make a quick buck. You have my word I will make it right. Callaway Great Big Bertha Epic 15 Degree 3 Wood HEAD ONLY. Has a chip on the back of the crown. I am not in this to make a quick buck. You have my word I will make it right. Condition: Face and sole wear. dings, dents or idiot marks. The pictures are of the actual item. What you see is what you will be buying. Cover: Matching. Callaway Epic Flash 3 Wood Tensei Blue 75 Stiff Shaft. Condition is Used.Slightly used Demo club (Inside Only) No Tool Headcover Included .Shipped with USPS Priority Mail. Same day when possible. Callaway Great Big Bertha Epic 15 Degree 3 Wood HEAD ONLY NICE !! CALLAWAY ROGUE 15* 3 WOOD W/ ALDILA SYNERGY 60 REGULAR FLEX SHAFT.